Share the magic of train travel with your children on this journey from Canada’s West Coast to Rocky Mountains. Adventure through the cosmopolitan delights of Vancouver, travel onboard VIA Rail’s “Canadian” train, and arrive in the natural splendor of Jasper and Banff National Parks. You’ll enjoy carefully selected outdoor adventures, combined with plenty of time to relax and spend time together. Planning a perfect family vacation can be like piecing together a puzzle. Let us take the stress and guesswork out – we’ll suggest the best activities, accommodations, and itinerary for your family. Rather than driving the entire way, try something different! Start your trip off with a train journey onboard VIA Rail, from Vancouver to Jasper National Park. Settle in, relax, and share time together – plus experience sleeping overnight in a private berth. Surrounded by mountain peaks, glaciers, and turquoise lakes, you’ll find that devices are soon forgotten. Feel happy and tired at the end of each day, as you recount your adventures over dinner. Spend the day exploring Vancouver with your choice of exciting activities. Your zipline tour will give you a unique perspective of Grouse Mountain, combining heart-pounding thrills with an exploration of BC’s old-growth forests. Along the way your fun and friendly guide will look after your safety, and share stories with you that will leave a lasting impression. Enjoy a Talking Trees walk in Stanley Park followed with a visit to the Vancouver Aquarium. One of the most exciting moments of your trip has come, as your family boards the famous 'Canadian' Train, bound for the Rocky Mountains. Explore the train, or settle into your cozy cabins. Check-in at Pacific Central Station and relax in the first-class lounge. Leave coastal Vancouver behind, as you journey towards the Rocky Mountains. Mingle with fellow passengers in one of the train's lounges, or settle in and watch the ever-changing scenery. You'll enjoy delicious meals in the dining car. Awake today as you wind your way into Jasper National Park. Share time in the viewing car, and keep your eyes open for waterfalls, wildlife, and glaciers. Jasper is a Dark Sky Preserve - ask your Vacation Advisor about special planetarium experience here. Awake to see the towering peaks of the Canadian Rockies all around you, including it's highest peak - Mount Robson. After breakfast, you'll arrive in the small town of Jasper, in the heart of Jasper National Park. 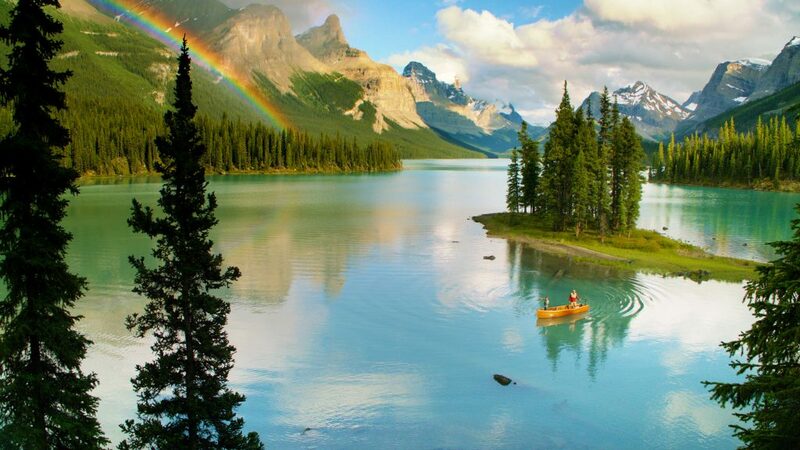 Enjoy scenic views from the Jasper Skytram as well as a leisurely cruise on Maligne Lake. Today you will drive along the spine of the Rockies, on what is considered one of the most beautiful roads in the world – the Icefields Parkway. Enjoy a full day of exploration as you travel from Jasper to Banff with adventure stops along the way. Travel onto the surface of the Athabasca Glacier by Ice Explorer and then walk on an exciting cliff-edge walkway which leads to a glass floor platform. Overnight at the Hidden Ridge Resort. Tucked away on Tunnel Mountain, this property overlooks the town of Banff and features beautiful views of the Canadian Rockies. The mountain resort offers condo-style accommodation and a wide-range of amenities, including outdoor hot pools, sauna, barbeque and picnic areas, bike rentals, and complimentary Wi-Fi—all just a short drive from downtown Banff! Enjoy another day to explore Banff and it's spectacular surroundings. Today you depart the fresh air and colorful sights of the Rockies as your family adventure comes to an end. Walk in Sunshine Meadows is available from the June 24 to August 26, 2019 eastbound departure dates / June 27 to September 1, 2019 westbound departure dates. Whitewater Rafting Trip is available until the September 2, 2019 eastbound departure date / September 5, 2019 westbound departure. Via Ferrata tour in Banff is available until the September 2, 2019 eastbound departure / September 5, 2019 westbound departure. Minimum ages and weight restrictions apply for certain tours, ask your Vacation Advisor for more details. Maligne Lake Boat Cruise: Early departures in May and late departures in October can not be guaranteed as weather conditions such as ice on the lake, may impact the cruises opening date for the season.